Even though we are just getting over another "Snowmageddon," spring really is just around the corner. That means it's time to gather your potting supplies, seeds, and tools and start those seeds. 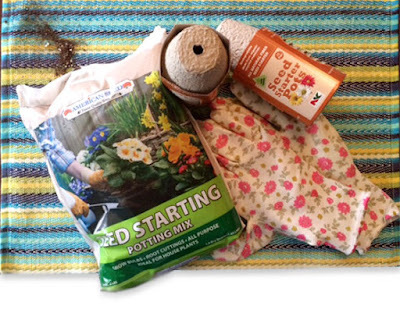 For starting seeds you really do need plenty of seed starting mix. That is probably one of the most important things. People disagree about what kind of mix is needed, and I will be going into that, but it is probably more important to keep seeds warm and moist. At least that is what I have found has added greatly to my seed starting success. I have seed starting mats that keep my seeds and potting mix warm, but not hot, and I like to have a cover over my seed starting trays that holds in the moisture. I usually purchase the heat mats online but the trays and other supplies I can get at the discount, hardware, or seed stores. Right now is the time to start scouting for what you need. I love stopping in my local "Dollar store" to see what they have. I found a very small section of potting mix, pots and gloves the other day. The gloves I was really happy to get because they have a plastic coating on them. I've never seen that before at these places. It won't be long until the supplies keep growing there but I can tell it will be a big year for gardening since there are so many supplies being sold so early. Also, clean your existing pots. Some people use a weak bleach solution but Simple Green is very good for washing pots and it won't ruin your clothes. Sometimes we use strong solutions when we really could get away with using something more natural. Give your tools a good cleaning, too. After washing them off, clean them with alcohol and then you will be ready when planting time is here. 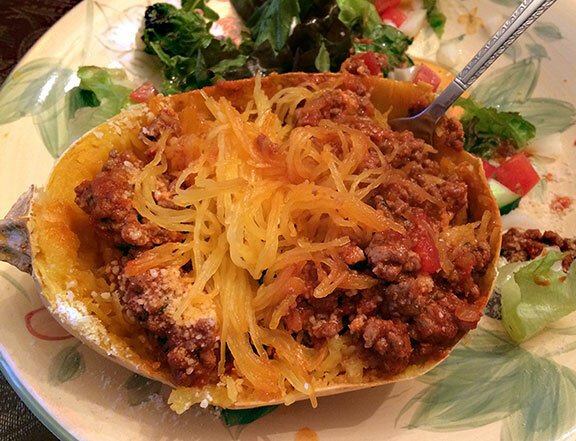 Since we have been on a low-carb kick we just can't get enough Squa-ghetti -- our name for substituting spaghetti squash for wheat or rice spaghetti noodles. 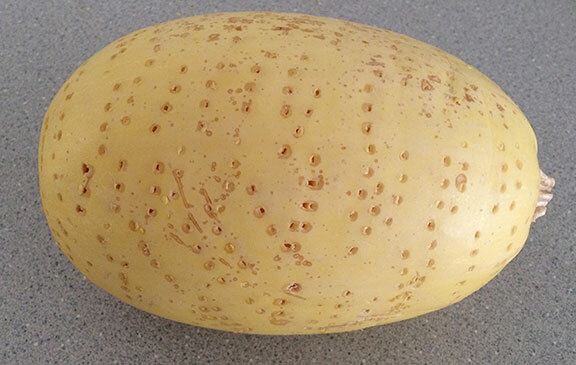 The interesting thing is, we are beginning to enjoy eating the squash better than the pasta. We really LOVE it. The squash has this flavor that goes perfectly with marinara meat sauce topped with a bit of Parmesan cheese. We have tried it with ground beef, turkey and just sauce, and there isn't any way we dislike it. We don't however, like cutting the squash up before cooking it. 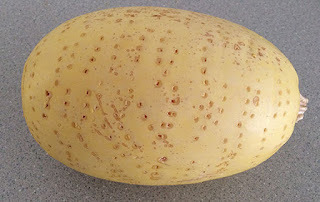 It is kind of a hard squash until it's fully cooked and cutting it in half and taking out the seeds is almost dangerous. I have come very close to having an accident requiring stitches. The good thing is that we saw this tip online, tried it and it has just made cooking spaghetti squash SO easy. We just prick it with a fork, stick it, uncovered in a 350 degree oven and it's done to perfection in an hour. 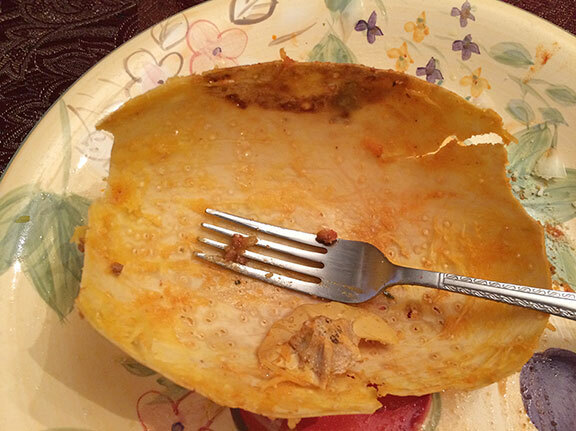 If you have a really big squash, add 15 to 30 minutes. You can't go wrong. Then all you have to do is carefully cut the hot squash in half, scoop out the seeds and pour on the sauce and you have a really great meal. It even makes it's own little bowl! I like to mix it up a bit. Eat some salad. And I feel like I just had one wonderful, filling, healthy, low-carb meal. I am so full and so happy. 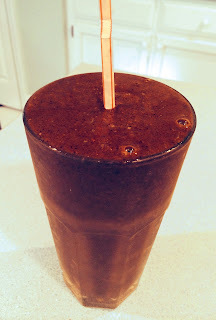 Every year about this time I go back to my favorite breakfast--a nice, healthy smoothie. The nice thing about smoothies is that they can be versatile, they're high in vitamins, minerals, fiber, and they taste really good. It can be a good way to get your daily allowance of fruits and veggies without having to peel, chop, or dice and that is not something I want to do early in the morning. My favorite includes an orange, apple, banana, carrots, kale, frozen blueberries, and a few frozen strawberries. Everything gets ground and blended in my Vitamix blender and breakfast is done. I can sip it leisurely or take it with me. The only negative is that it can be really messy, and if you don't wash the glass out immediately, you may have to soak it. I also like to add some herbs at times. If you feel like you are coming down with a cold, add echinachea (from a tea bag or capsule), and cinnamon, or other herbs that help with cold symptoms. You can always make your favorite smoothie with tropical fruits like mangoes, pineapple, and add a healthy dose of ginger. Lately, ginger and cinnamon have been credited with helping to lower high blood pressure and blending them into this healthy treat is a great way to get more of these spices. It's also a refreshing way to cool down after exercise, so get out your blender and blend up some healthy potions. It will be more like a treat than a healthy meal. Most families have one special treat you associate with special family nights. 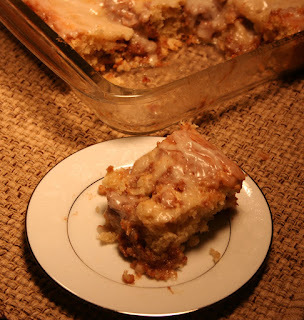 Ours was always my recipe for sour cream coffee cake. We sometimes made it for movie night and sometimes for company. It was really a special treat for our family. We served it warm with coffee or hot tea and some of us fought for the center pieces because they were a little more gooey than the outside pieces. We were really onto gooey. Tonight, the National Championship FCS Bowl game would be a very good time to make this treat and that is why I am sharing. I do have a gluten-free version that is just as good and almost as gooey as the wheat version. I have even taken some of the sugar out of this version so it is a little better for you. One caution. Don't equate gluten-free with healthy. This is about the same as a non-gluten free dessert in the healthwise department. The only thing that makes it a little better is that there is that wheat is now engineered to provide more gluten to make it "better" when baking. The problem is that more and more people are finding the "new and improved" varieties are causing more allergies and stomach issues. That is why making a gluten-free version is a good alternative whenever possible. Here is my not so good for you but gluten-free version of Sour Cream Coffee Cake. The wheat version of this coffee cake was a huge family favorite, and it is the most requested recipe we have. The gluten-free version took a couple of tries, but when it was right it was really right. What does it taste like? It’s kind of like mixing cinnamon rolls and sweet muffins. This recipe includes a batter, a filler, and a glaze, and it is admittedly not our most healthy recipe. You’re going to love it! Combine sweet (glutinous) rice flour, sorghum flour, sugar, and cinnamon in a small bowl. Cut in butter with a pastry blender. Mix well and set aside until the batter is complete. Preheat oven to 350 degrees. In a small bowl, combine potato starch, sweet (glutinous) rice flour, sorghum flour, corn starch, baking powder, and salt. Stir with a wire whisk. In a large mixing bowl, combine sugar, eggs, and butter and beat until well combined. Add sour cream and vanilla, then pour in the flour mixture and combine well. To 1/4 cup water, add the xanthan gum and stir. Add the xanthan gum and water to the batter and stir well. This mixture doesn’t need too much beating. Hand mixing works well with this recipe. Pour the batter into a greased 9 x 13-inch pan or baking dish. Using a spoonful of filling at a time, top the batter with the filling. The filling will sink into the cake, and it is better if filling is formed into at least teaspoon-sized pieces and placed all over the top so that each piece will get some of the filling. Bake in the oven for 25 to 30 minutes or until cake is firm on top. Allow cake to cool while mixing the glaze. Mix the glaze and pour over the top of the warm coffee cake. Makes 12 servings. Today we woke up to cold weather and unfortunately, I also woke up with a cold. All the symptoms of a normal cold. Sneezing, coughing, runny nose, the works. Instead of waiting until it gets worse and going to the doctor, I am going to try something new. 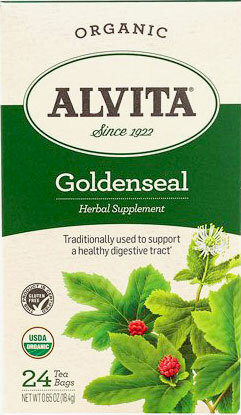 Goldenseal, touted as a natural, mild, antibiotic. 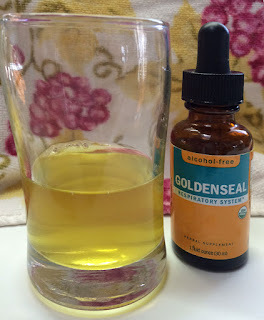 It's something I have been using for awhile as an eye wash.
My eyewash formula is Goldenseal in a saline solution (an equal mix of 1/2 tsp sea salt and 1/2 tsp baking soda dissolved in 2 cup of warm water and a dropper of Goldenseal). Since my problem has been a congested eye that just doesn't want to stay open in the morning, I can say this is a real eye opener--works every time. I have read that it should not be used consistently longer than three weeks. My daughter has also been adding Goldenseal to her nasal rinses (basically the same mixture as above) and it has helped her to prevent secondary infections that normally are the aftermath of a cold. She has been using it so successfully that I am giving it a try time time for my cold. I originally bought organic Alvita tea and brewed it. (1 tea bag, 1 cup hot water, let it steep at least 15 to 30 minutes) The cooled tea brew is a great eye wash without any saline. It can also be used as a gargle, plus I have just downed the tea, but I will tell you, it really is a bitter brew. The tea recommends using it for digestive health, though I have not tried it for that. I have plans to order some rhizomes to plant in the woody area behind my house. I would love to harvest Goldenseal and dry it to make my own tea. This is an eventual goal, because in addition to it being hard to grow, it is also in danger of becoming extinct. Until then, I will use the tea and the drops I have purchased, and I am so glad I have them. This is the worst-smelling herb I have ever raved about. Should everyone try it? Probably not. If you have any major health issue, consult with your doctor before trying it and don't be surprised if the doctor might not be a fan of this (or any) herbal remedy. Thankfully, I am in good health and I am enjoying the benefits of Goldenseal even if the taste reminds me of old gym socks. HAPPY 2016! 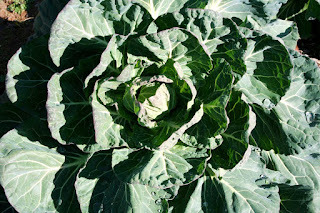 May you eat plenty of collards. Every year we walk around on New Year's Day saying things like, "I just can't believe another year has passed." We should be a little more positive by saying this: It's the best day of the year to cook one of our favorite foods which, by the way is COLLARDS. 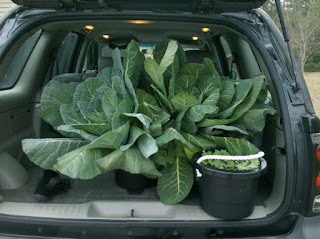 Not only do we eat collards, but we grow them especially to serve them on New Year's Day. We usually start in August, by planting and caring for them until there is a nice frost. Then it is time to harvest and serve them along with black-eyed peas, spicy Mexican cornbread and other New Year's Day dishes. It's an honored family tradition to eat them and we honestly LOVE them, unlike so many who turn up their noses at the thought of these delicious greens. And I'm not just talking about the cooking smell! That means if we invite you to dinner on New Year's Day, you WILL be served other things, but collards will be the number one item on the menu and we really won't understand how you could not love them as we do. After that, we will have collards, maybe even collards large enough to fill my SUV, and they will be good and good for you, but they won't be New Year's Day collards so they won't be as important as they are on this first day of the year! 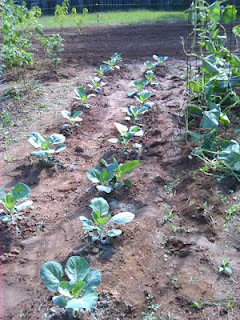 We will also add them to soups and smoothies and even saute them in stir frys but no other dish can compare to collards on New Year's Day. As you might have noticed, I haven't been blogging for some time but I have decided to start again this year and will focus on gardening, recipes and ideas for those with allergies, healing herbs, and herbal remedies. I wish you all a very happy New Year's Day. I hope your new year is prosperous, you are in health, you have the opportunity to eat collards like my family, and you will enjoy them as much as we do! My daughter texted these photos of her last-minute Valentine's Day cards on her phone last night. She rushed to the store for last minute Valentines which she had forgotten early in the week. She meant to get some items earlier, but as all modern-day Moms know, sometimes you just get busy and things slip by. That is where Pinterest comes in. She found these Pinterest cards to download and print on her home printer and they were perfect for her boys to take to school this morning for Valentine's Day. I must admit, Valentine's Day was much simpler in the past when all you had to do was grab a little package of cards at the grocery store or pick up some heart-shaped candies. Sometimes we even made cookies to take to school. That is not an option anymore with all the diet and other restrictions. Only store-bought and approved school items are allowed. That is why most of the suggested items are pencils and bagged candies. I thought my daughter did such a great job and had this done in no time. Her text in all caps, THANK GOD FOR PINTEREST!